Dawn soap. It's something you will always (always!) find in my house. When I was a child we grew up with Dawn in our home as my Dad was always working on 'something' and it usually involved dirt and grease. He tried many cleansers through the years but he found he could quickly and easily clean the grease off his hands (wrists, arms) and nails with a simple mixture of sugar and a little Dawn dishwashing soap. After I married my husband and we were setting up our own lives 2000 miles from 'home' I made a point to be sure to try different products than the ones I was raised on, just to see if there were better choices out there. I know you can get in a rut and buy the same thing over and over again for years just because it's what you use. 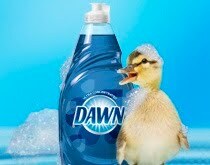 In the case of dishwashing liquid, I always come back to Dawn. (I like Palmolive original green for the scent, but nothing beats the grease cutting power of Dawn). This isn't surprising since Dawn is the choice experts have used for years to help clean wildlife after oil spills. So, in honor of the soap that has been a part of my life for as long as I can remember, here are a couple homemade 'recipes' using Dawn. Have your wife or daughter turn on the faucet and stick your hand under just for a second to get it damp. Have them turn the water off for you (because if you touch the faucet with grease all over your hands your wife will get mad). Next, have that same person grab the sugar dish and sprinkle sugar into your palm. About a tablespoon will do for heavy grease and dirt. Now just a quick squirt of blue liquid Dawn. Rub vigorously as if you were 'washing' your hands. Use a nail brush if it's really in your nail beds. Now rinse. Repeat if necessary, but it's not usually necessary. Heat vinegar in microwave until hot and pour into squirt bottle.Add the Dawn soap. Put the lid on and slowly turn upside down and back up to gently mix the two. This cleaning solution works for bathrooms, kitchens, appliances; just spray and scrub. For heavy soap scum or build up, spray on liberally, let set up to 8 hours and then clean and rinse. Mix gently and put into a spray bottle. Use on stains and spots in the laundry. If you doubt the color fastness of the item, be sure to test a drop in an under seam or other hidden area first. This can also be used on fabric linens, carpets and furniture. Again, if you wonder about your item, test in an inconspicuous place first. I had a white and baby blue stripped French Country style denim couch.... and 2 children under the age of two. I found this mixture and a white wash cloth or scrub brush worked miracles. I would follow up with extra clear water on the spots to saturate and then let dry. By the next day the spot was dry and pretty again! A couple of my friends are serious runners. Why this doesn't rub off on me, I'm not sure but here is a hint many runner's apparently know to use when they need an ice pack. I was told to use Original Palmolive but since then I heard another person say Dawn works too. Since I'm not a runner, and my two athletic kids are now off to college, I don't have need of this too often so I've not tried Dawn instead. I'm told it works. Fill a Ziploc baggy with the liquid soap. Place in a second bag just for safety from leaks. Place in the freezer. It will not completely freeze but will be become a thick gel, perfect for molding to a sore knee or ankle.